Tom, this works except it also brings up the big Microsoft visualization screen where you drop the code into, and it is not on top. Is there something in the text that needs to change so this doesn’t show up and it is on top? Tom, there is also and error that says something about “Expected String constant”. Here is what it looks like. This site’s comments engine appears to have reformatted Tom’s straight quotation marks (in his VBA code) as “curly” ones. Not sure if fixing that will cure all problems, but it should cure syntax issues. Great stuff, no more missing appointments, usually have multiple OCS etc. flashing away in the toolbar so have learned to ‘blank out’ that method of notification. I modified the code to display the actual windows and handle reminders from tasks. This is old, but thank you this is a huge help. Thanks for this article. Regarding the explanation for why Microsoft doesn’t make the reminder stay on top and thereby make reminders USEFUL(!! 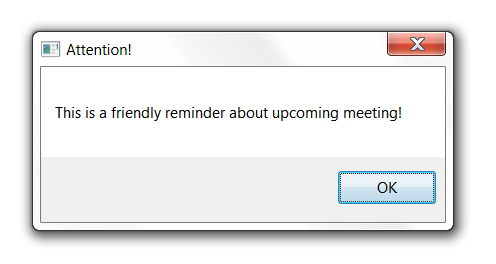 ): All Microsoft has to do is not have any default buttons on the dialog. I’m regretting moving to Outlook 2013. These hidden reminders are completely useless. I cannot get the above VBA code to work. Please recommend an easier solution – any third party addon maybe? Download Outlook Reminders On Top. It was written to fix this exact situation. It brings the reminder window to the top without taking focus away from whatever other app you’re working in. Try using Outlook Web…no notifications at all, except a tiny number that blinks in the top corner, and that’s only if you are looking at the application. Thank you! The message is a great help!! 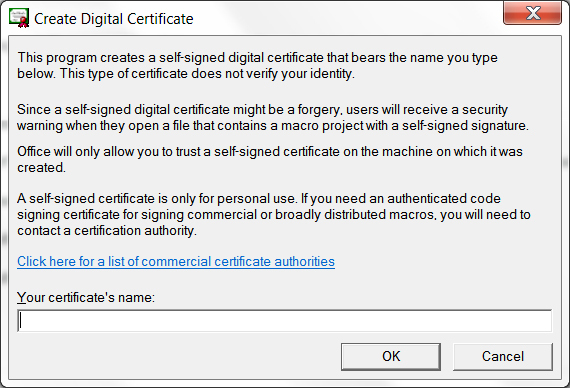 This works great – however I did have to “Trust” that cert upon the first restart of Outlook – no more questions or prompts after that and is working great. For those interested, I’m using Win8.1 and Office2013. Outlook is prompting me to save the VBA project every time I close Outlook. Even though I’m saying yes. I’m using Outlook 365 ProPlus. Any words of wisdom? I received the pop-up message to save the VBA project only once. Upon re-opening outlook, I received the “Trust” pop-up mentioned by Frank, but only that one time. No other issues since. I’m running Outlook 2016 on Windows 7 Professional. 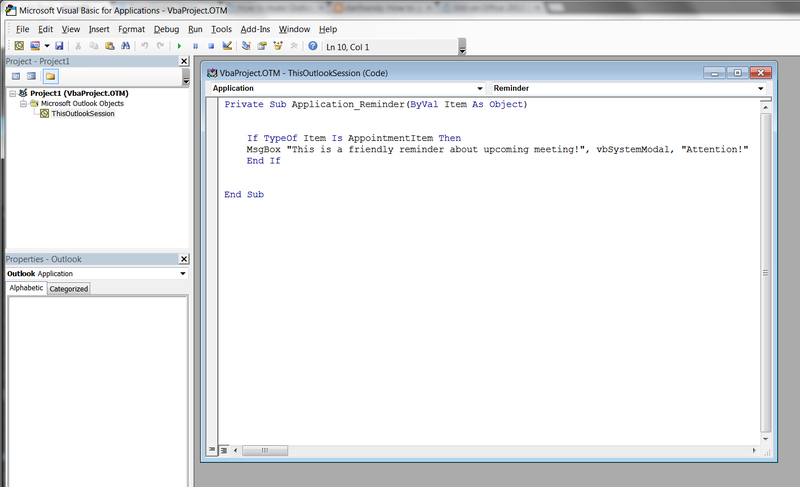 I ended up using Don’s code above, but the only thing I would prefer is that only the reminder window pop-up. On my machine, it brings the reminder window up, and along with it the Outlook window as well. You don’t know how pissed off I am at Microsoft over this issue. Myself and others have been begging those idiots to fix this for years. Why have appointments if the reminder does not interrupt you? Flashy icon? When I’m writing code the world could come to an end and I would not notice it. The one case where the pop-up works and now it’s like pulling teeth out of a chicken to even get MS to recognize that this is a problem! Your solution works in Outlook 2013/windows 7 and I am grateful for it. Just popped up! Yeah, it works, thank you! thank you! thank you! Previous PostPrevious Bluehost vs GoDaddy – Webhost Wars: Which Should You Choose?